I don’t always trust restaurants where the chef has his (or her) latest glossy cookbook on prominent display. Chances are the place has peaked, or it’s overrun with crowds of preening admirers, or the chef has vanished from the kitchen to make an appearance on the Food Network, say, or to open a new branch of his (or her) fabulous restaurant in Las Vegas or Shanghai. But when I spotted Laurent Tourondel’s new cookbook for sale at his new restaurant, BLT Fish, I actually bought a copy. Tourondel, formerly of the great, defunct seafood restaurant Cello, as well as, more recently, the successful steakhouse BLT Steak, is a master seafood chef, after all, and his book brims with recipes for esoteric bisques and lobster risotto. There are instructions on how to fold fresh trout in prosciutto, or cook fillets of arctic char in parchment papillote. There are many delectable-looking pictures of these dishes, of course, and as you wait for your table at BLT Fish, you’d be wise to browse through them, as, I’m sad to report, few of them are available at the restaurant itself. For Tourondel enthusiasts, this is a gloomy state of affairs. But then BLT Fish, which opened not long ago in the Flatiron district, is an oddly dispiriting place. It’s an ambiguous, strangely contrived restaurant, one that seems, ultimately, to be a slave to formula and profits instead of innovation and craft. Like lots of big-money establishments these days, it’s designed to be two restaurants in one. Downstairs is a raucous seafood parlor called “The Fish Shack,” with a laminated blue marlin on the wall and a high-volume cocktail bar peddling drinks with names like Squid Ink and Shark Bite. You can purchase several decent sandwiches at the Fish Shack (notably, the $24 lobster roll), but most of the food is forgettable. The real culinary action is upstairs, at BLT Fish, which you reach via a glass elevator. This is where Tourondel holds court, in a grand room featuring luminous circular lampshades, a gleaming open kitchen, and an atmospheric glass roof left over from a failed Asian-fusion restaurant that once occupied the same space. 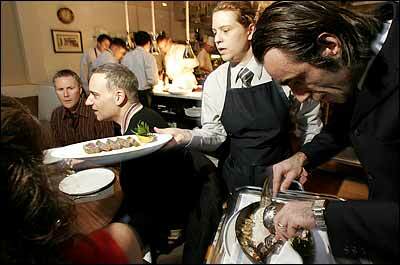 More than most superstar chefs, Tourondel is acquainted with failed restaurants. His greatest success, Cello, was a seafood restaurant of the most sophisticated, even dazzling kind, but it closed abruptly when the owner began hemorrhaging cash as the technology bubble burst. His next venture, BLT Steak, was cannily designed to withstand almost any kind of financial misfortune. Steakhouses are practically bullet- proof, after all—the restaurant world’s equivalent of U.S. savings bonds. But Tourondel employed the fashionable conceit (pioneered by Tom Colicchio at Craft) of building your own meal around different ingredients, and in so doing he managed to infuse the standard beef-house formula with new highbrow technique. As the name suggests, BLT Fish is supposed to be an extension of this brand. The menu is divided into simple categories (Whole Fish, Fish, Vegetables, Sauces, etc. ), which we are encouraged to mix and match. But what works for steak doesn’t necessarily work in the more tricky, ethereal world of seafood, and in the end the results are oddly flat, even inert. Every table at BLT Fish is kitted out with a salt shaker the size of a small watering can. Before the meal, every table is also served a batch of warm, delicious biscuits flavored with Cheddar cheese and chives. These biscuits are a conscious echo of the much-praised popovers at BLT Steak, but what they have to do with seafood isn’t entirely clear. Then come the appetizers, which are the most successful category on the menu, mainly because they give Tourondel an opportunity to actually do some cooking. There’s an intensely smooth square of spicy tuna tartare, layered with avocado and crowned with a spoonful of caviar. There’s a salad of pricey ($18) though well-grilled octopus tentacles, and an interesting BLT variation made with grilled sardines, fresh baby tomatoes, a sliver of bacon, and a single piece of oil-soaked toast. If you want to spend some cash, order the Ecuadoran shrimps (three for $23), which are garnished with tiny silver anchovies and go very nicely with a cup of mayonnaise spiked with cilantro and lime. When it comes to the main Fish section, however, things go strangely wrong. I didn’t know quite what to do with my piece of unadorned Icelandic halibut, which looked lovely in its clean, blocky whiteness but was overcooked. The best of the group was the cod, which the chef flavors with perhaps too much acacia honey, and the swordfish, which is flavored with a blend of what my voluble waiter (I’ve noticed the complex mix-and-match menu formula tends to turn every waiter into a carnival barker) called “Mediterranean spices.” But my salmon steak looked as though it had been thrown on the grill straight from Citarella, and the scallops were fresh, if a little sad, sitting more or less alone in their big white bowl. The Whole Fish category is filled with giant snappers and lobsters, which diners are encouraged to wolf down “family style” like so many haunches of beef. Unlike most haunches of beef, however, the fish is priced by the pound, so costs can accelerate in a hurry. The John Dory I sampled tasted mildly vulcanized, even semi-frozen, and cost a grand total of $87. The puppy-size lobster was showered in an ingenious mix of panko bread crumbs and black olives but cost as much as a low-end iPod. Ditto the tasty, salt-baked New Zealand snapper, which cashed in at around $90, and the very good Cantonese-style red snapper, which is about four times what you can expect to pay for the same dish down in Chinatown. A few carefully produced, often excellent intermezzi are shuffled in between all this food (notably, eggshells filled with scrambled eggs, littleneck clams, and caviar), but it doesn’t make much difference. In the end, the chef’s genius is throttled by his own cumbersome formula. If you’re a Tourondel fan, it’s like paying good money for a Bach recital by Yo-Yo Ma, then listening to the master saw through a program of children’s nursery tunes instead. The overwrought sauces and steakhouse-style side dishes (dried-out pommes soufflés, treacly-sweet parsnip purée) don’t do much to alleviate this grim state of affairs. Neither do the desserts (a good bread pudding laced with apricots, boring chocolate praline cake, a nice meringue dish with banana passion-fruit sorbet), which are professional in a straightforward, uninspired way. You don’t even have to eat dessert, since every table receives a jar of gimmicky green cotton candy to chew on after the food has departed. It tastes like some oddly sweetened form of green-apple shampoo, and in case you’re wondering, the recipe isn’t in Tourondel’s new book. Prices: Appetizers, $9 to $23; entrées, $27 to $36. Ideal Meal: Spicy tuna tartare, Cantonese-style red snapper, caramelized meringue with banana passion-fruit sorbet. Note: Whelks (large, snail-like sea creatures) are available at the Fish Shack; they’re surprisingly tender.